Pro-Spector Electroscope - FREE SHIPPING! This sleek, newly designed Electroscope is a fantastic scouting tool used to locate an area of interest for treasure hunters and prospectors. The Pro-Spector has separate gold or silver settings and digital tuning to adjust for optimum tuning. It also features large, visible, numbers on the LCD screen, which provides you with a more intense attraction to the desired material in the field. The LCD is backlit for low-light conditions and for better visibility. The ten turn tuning knob is very precise. The antenna system also becomes a tuning mechanism when the Pro-Spector is adjusting the antenna length in conjunction with the tuning knob setting -- providing the most accurate tuning. The 9-volt alkaline battery life is monitored with a battery icon on the LCD. 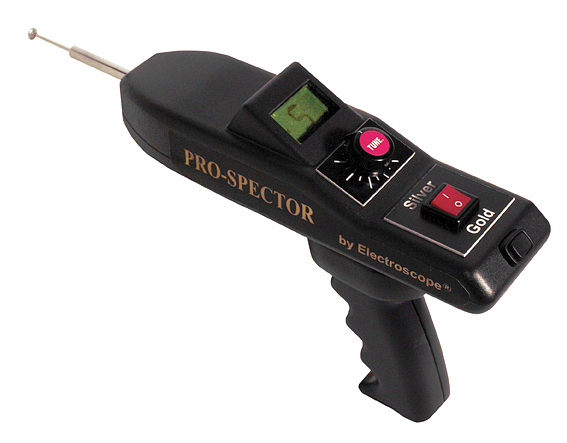 Cover more ground and save precious time with a Pro-Spector Electroscope!